The rally, protest and dharna against the proposed Citizenship (Amendment) Bill, 2016, are continue in all over Assam. 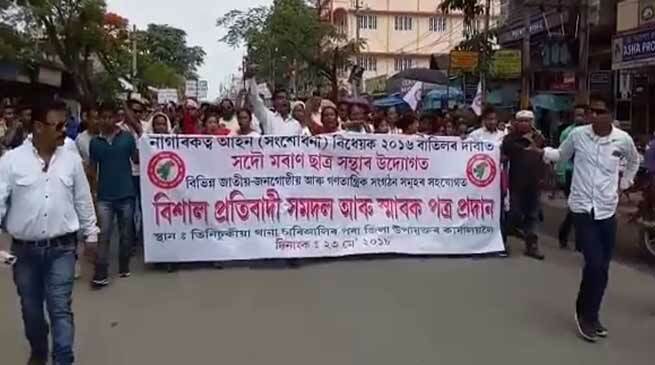 The All Moran Students’ Union (AMSU) organised a massive at Tinsukia on Wednesday, against the proposed Citizenship (Amendment) Bill, 2016. More than 20,000 people, included participation from various communities from across religious and linguistic groups took part in the rally. Before the rally at Thana Chariali a protest meeting was also held, where various speakers spoke on the need to scrap the controversial Bill. A huge procession thereafter marched towards the DC’s office at Borguri, a distance of about 2 kilometres, where a memorandums against the proposed Bill were submitted before the Deputy Commissioner, for onward transmission to the President, Prime Minister, and the Assam Governor and Chief Minister. These memoranda were accompanied by signatures of 30,000 persons and office bearers of 2000 organisations. Kakopothar Block Congress Committee (KBCC) on Wednesday took out a protest rally against the proposed Citizenship (Amendment) Bill, 2016. The rally began from Rajiv Bhawan, Doomdooma and ended at Doomdooma Revenue Circle office. Around 500 party workers participated in the rally, which was led by Doomdooma MLA Durga Bhumij. The protesters sent a memorandum to the chairman of the Joint Parliamentary Committee opposing the Bill.